The right gift has the power to change a kid’s life. Give the gift that makes her dreams possible. Give a kid you love a GoalCard - a digital gift that gives kids real money towards real dreams in a real FDIC-insured savings account. You don't need a Goalsetter account to give a gift, and neither does the lucky kid. Just an email address! 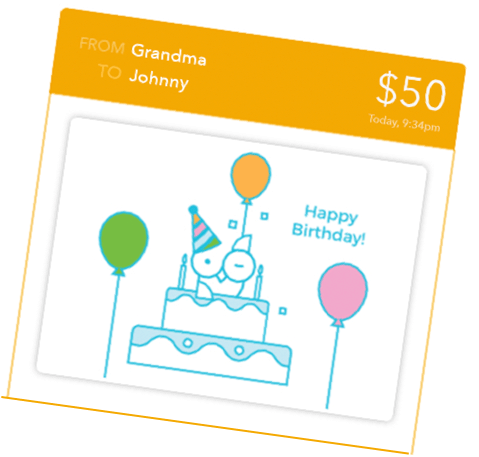 Kids will receive a fun digital GoalCard with a video, photo or gif and real money to save for short-term wishes or long-term dreams. Kids can save towards something special or “just because." Whether a kid you love has a specific goal in mind, or just wants to save, a GoalCard is just right for them. GoalCards can be cashed out immediately or saved in an FDIC-insured Goalsetter account until the kid's goal is reached. Concert Tickets, Camera, or College, here we come! We wish we didn't have to charge anything, but our fees help us to pay our transaction processor and spread Goalsetter everywhere. $1 Less than wrapping paper or a greeting card. *If you are paying by credit or debit card, Goalsetter adds a charge of 2.9% + .30 that goes directly to our card processor. ACH payments have no additional fees. And, we give 5% back to kid's related charities.